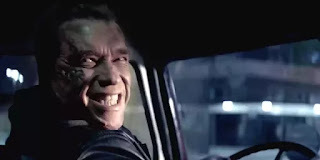 Ok I went to see the new Terminator movie, probably as a result of my twenty plus years longstanding with the movie franchise and Mr. Commando himself. The Terminator: Genisys in my opinion is probably the only big blockbuster movie besides maybe Furious 7 this year that actually has a storyline. 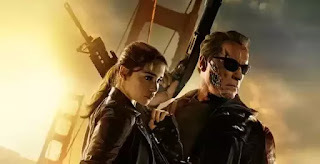 The Terminator Genisys is a reboot of the popular franchise, which is quite necessary considering that John Connor (Christian Bale) had defeated Skynet in Terminator Salvation. The Terminator Genisys explores an alternative timeline with which Sarah Connor (played by Emilia Clarke, Khalessi in the Game of Thrones) had already made contact with the T800 Terminator (Arnold) at a much earlier time an event which changes everything and the timing of Judgement Day. like the first Terminator movie, Carl Reese is also sent back in time to protect Sarah from the Terminator. Reese meets a changed Sarah, who isn't content with playing the victim here and is on the offensive to take out the Terminators with the help of Pops, an older T800 Terminator played by Mr Schwarzenegger. Together, the three companions fight their way through different times in Los Angeles to save mankind from Judgement Day. Overall, I rate the Terminator Genisys a 3.5 out of 5. the plot was complicated enough to carry the movie. The CGI used in the movie was top notch and realistic, the action was very realistic and wasn't over the top. As an all out action movie there isn't much need for dialogue although It kinda felt weird listening to Arnold explain time travel. I half expected Emilia Clarke to steal the show based on her role as Khalessi in the Game of Thrones but there was no mistaking who the real star of the movie was. Going from the trailer to the movie, my connection with Emilia was transferred to Arnold Schwarzenegger (strange, eh? ), in some way I couldn't really connect with either Emilia Clarke or Jai Courtney roles in the movie. On a side note Dr Who fan's might be a little thrilled to see Matt Smith in Terminator movie, shame he had a very small role to play in it. VERDICT: 3.5/5: A enjoyable movie to pass the time with especially if you followed the franchise as a kid. And yeah, your Kids would love it.